Back in July 2016, premium sports carmaker Porsche had launched the Cayenne Platinum Edition in the country. Following its success, this time around the automaker has launched the Cayenne S Platinum Edition in India, where the petrol variant is priced at Rs 1.27 crore and the diesel version is priced at Rs 1.31 crore (Ex-showroom, Maharashtra). The Platinum Edition cars offer more features and equipment in comparison to a standard Cayenne S.
In order to draw a clear line of distinction, Porsche offers the Cayenne S Platinum Edition with a few blackened bits instead of chrome that is prominent in standard version. The vehicle now gets new bi-xenon headlamps with Porsche Dynamic Light System and body coloured wheel arches. For uniqueness, the vehicle now sits on 21-inch wheels instead of 18-inch wheels that are offered on the standard variant. 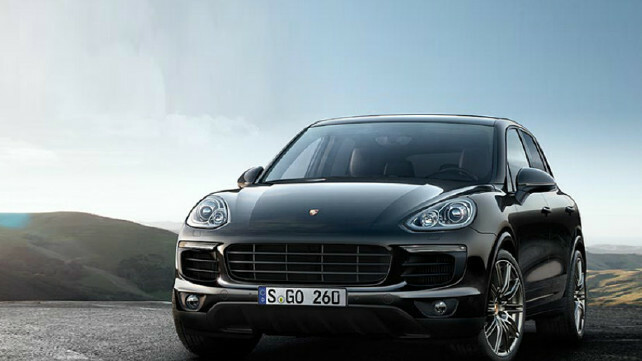 The Platinum Edition Cayenne S is available in shades of Jet Black, Mahogany, Rhodium Silver and Carrara White. Speaking of interior, the Cayenne S Platinum Edition features leather and Alcantara upholstery, eight-way adjustable sports seats, Platinum Edition badging on the sill guard and seat headrests with Porsche logo. The vehicle also gets heated front seats and touchscreen navigation system with Bose audio system. Moreover, it also gets dynamic cornering system and front and rear parking sensors. There are no changes in terms of engine specifications and the Cayenne S Platinum Edition’s petrol variant is powered by a 3.6-litre twin-turbo six-cylinder engine that comes mated to an 8-speed tiptronic S transmission unit to put out 414bhp of power and 550Nm of torque. The diesel version on the other hand is powered by a 4.2-litre twin-turbo 8-cylinder engine comes mated to an 8-speed tiptronic S transmission unit which puts out 380bhp of power 850Nm of torque.